Reasons not to be an artist. Okay, so there is no viable reason not to create art. It doesn’t matter if you are bad at it, good at it, do it for fun, do it for a career, do it as therapy. You should create art. We all have an artist inside of us. There ARE reasons not to be a professional artist. I get asked quite often about how to make money as an artist, and if it’s possible to make a living off of it. I am generally very encouraging to those who want to pursue this path, but there have been a few times over the last year where I have cautioned someone to really think about their goals. I want people to follow their dreams, but there are times when someone’s ultimate goal doesn’t match up with the path of becoming a full time creator. I never tell anyone not to do art. Honestly, I think everyone should have a creative outlet of some kind. The question here is whether or not you should make a career out of it. 1.You think it will be easy. In the beginning you imagine the process like this: Paint something–>Put it out there–>Make money. Easy, right? When it’s more like: Paint something–>research hashtags–> stage the piece–>photograph in proper lighting–> post at an optimal time on Instagram–>link to a product listing from your online store–>price the piece appropriately–>post to Facebook, Tumblr, Reddit, Twitter, Pinterst, etc.–>wait for sales–>feel like a failure when it doesn’t sell immediately–>work on your skills–>create a new piece–>repeat the process over and over–>maybe make a sale! Wooooo! There are other variations to this sequence depending on where you display your work, but you get the point. Being a full time working artist is not easy. Even though I love what I do, there are many days where it does feel like work. You have to learn all of the aspects of a business, not just making art. It’s not easy and it doesn’t often happen quickly, but my goodness does it feel good when you see positive results. 2. You want to have fun all the time. A lot of people get the impression that artists just f*$% around in their studio all day and don’t have a care in the world, but there is a boring and tedious side to being a full time creator. Keeping up with social media, marketing, website building, tracking inventory, pushing your skills, sticking to a studio schedule, trying new materials, bookkeeping, taxes, applying for events, giving good customer service, and more. When art is your full time job, you spend a good chunk of time not creating. You won’t feel entertained and inspired all the time, but you have to create even when inspiration is lacking to maintain productivity. 3. You’re not willing to step out of your comfort zones and push your style. This includes technical skills and personal comfort zones. When it comes to skill, you need to be able to objectively assess your work and find your weaknesses while also developing your personal style. What’s going to make you stand out? Just because something looks good, doesn’t mean someone will buy it or see the meaning in it. An example of a personal comfort zone: I am an introvert, so I really don’t like doing events. Every time a show ends, I am left with a pounding tension headache from being ‘ON’ and interacting with strangers. My comfort zone is the studio—alone—but I continue to push myself out of that in order to build a following and make sales. What is your comfort zone? Are you willing to push yourself out of it? 4. You want to make a lot of money. Of course the goal of being a professional artist is to make money so you can keep creating–but don’t be an artist JUST to make money. If you don’t have a passion for creating, you are likely to be let down and stressed out for quite some time. 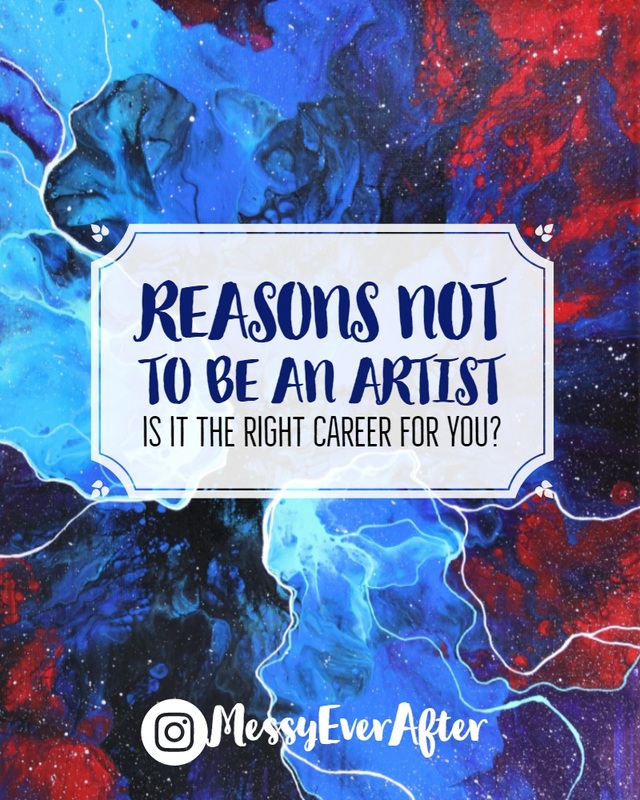 It’s completely possible to make a living as an artist—but it’s a much more demanding career path than most anticipate. There isn’t a correct and straightforward path to success so it involves a lot of creative thinking, dedication, and willingness to fail over and over again. When I quit my job October of 2016, I set incredibly low financial expectations for myself for the first year of being an artist. Obviously, I wanted to make money, but the more important things to focus on were developing my style and building a following. I knew that I needed to finally embrace that I am an artist, but I also knew that I would struggle financially for a while. 5. You think it will be a good money making side hustle. I was selling at a craft fair back in November, and a woman walked by my table and said “Oh, my daughter should totally do this. She could easily pay off her student loans.” It took everything in my power not to laugh hysterically and then cry a little. Most of the time, dedicated artists have side hustles to supplement their art income so they can still focus on creating, but it’s not often that someone will jump into an art career just to help bring in a little extra cash and have the return be worth the effort put in. Depending on the medium you work with and your cost of supplies, selling your creations as a side hustle isn’t likely to generate a lot of income in the beginning. If you are the rare person who found immediate success with creating a side income, I am genuinely happy for you, but for most people the amount of time and money that goes into creating inventory, building a display, applying for shows, building an online store, buying shipping supplies, and more negates the benefits of the income earned by the occasional sale and fair. I always considered it a win if I made enough to cover my art expenses when I was doing art on the side. But again, it depends on your medium. If you are creating digital art, releasing YouTube videos with monetization, teaching art classes, or anything that keeps your expenses and invested time at a minimum–then art could work as a side hustle. 6. You can’t handle inconsistency and instability. As an artist, you have to adapt to your situation. You never know where your income may come from or how to pay for your groceries from month to month. There is no guarantee that the commission you’re working on will end with a payment. Or that the outdoor event you booked this weekend won’t get rained out. Over the years, I have learned to adapt to my instability by trimming my lifestyle down and cutting as many extraneous expenses as I can. For example, I am still driving the same ’97 Neon I bought when I turned 16 to avoid a monthly car payment and I don’t remember the last time I spent more than $15 on a haircut. 7. You give up easily. If you are on Instagram or any social media site, you will come across a plethora of talented artists. Artists that have a larger following, incredible skills, and unique styles. This is an over-saturated market. It’s easy to think, “Why bother trying when I’ll never be like that?” My confidence is tested every day, because I worry that my work isn’t at that level–but the only difference between us and the incredible artists like @kelogsloops and @poli.bright.art is time. If you want to be a paid professional artist, it won’t happen overnight. It may not happen for months or even years, but if you put in the work, give yourself time, and keep going even when you feel like a failure–you’ll be unstoppable. 1.You can’t see yourself doing anything else. If you are passionate about creating, then you should do it! But, without passion, you run the risk of burning out or giving up before you gain momentum. Have you tried working a variety of jobs, but couldn’t find fulfillment? I have a long list of jobs under my belt. I gave them my all, but they never felt right. I’d always become antsy and restless after about 3 months. Now that I finally gave into the artist in me, it’s been 1 year and 4 months and I am full of drive to continue growing even though I’m still a “starving artist”. Passion keeps you going. 2. You’d be happy doing it even if you didn’t make money. Like I said before, it’s a slow process to make a living for most artists. A lot of us don’t have the luxury of not making money. Obviously we need to be able to cover our living expenses while building an art career, but can you find satisfaction in working 40 to 60 hours a week on art while barely covering rent? Can you arrange your life in a way where you can handle financial uncertainty for a while? Or, can you work a part time job to pay for your necessities as you focus on your art in your off time? Do you have a partner or roommate that is willing to take on a financial burden in exchange for you taking on other burdens? If art is your passion and you want to focus all of your energy on it–then find a way to do it, but know that it may be the most difficult and frustrating path you will take. And it can potentially be the most rewarding thing you have ever done with your life. I hope you found value you this article. My intention was not to dissuade anyone from chasing their dreams, but to help you feel invigorated to take on the challenges that come with it. Let me know if you have any questions or comments below, and as always, I am happy to provide my coaching services to any artist out there who wants encouragement and guidance on how to get started with their career.